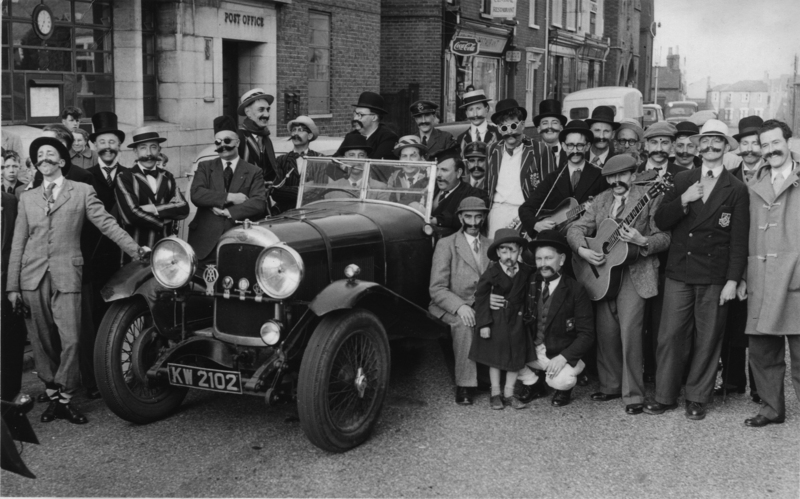 Toc H, a local men’s organisation that raised funds for distressed ex-servicemen, organised annual fund-raising events that involved dressing up and fun. 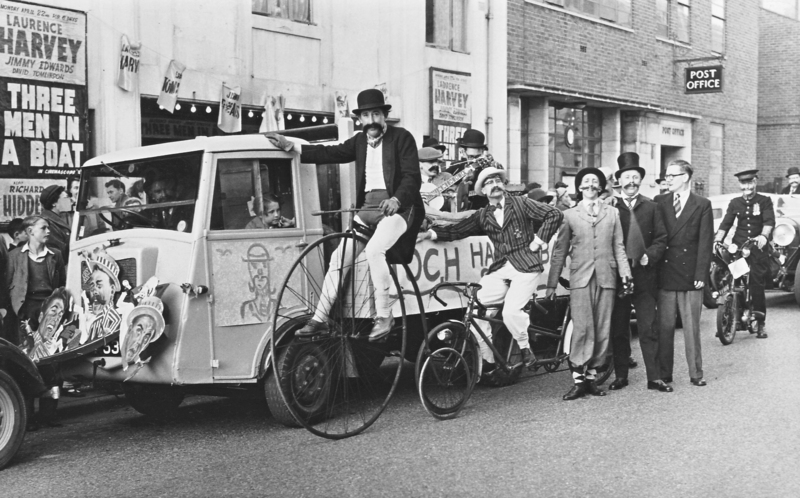 In 1957 they were inspired by the release of the film Three Men in a Boat whose stars included Jimmy Edwards who was well known for his handlebar moustache. 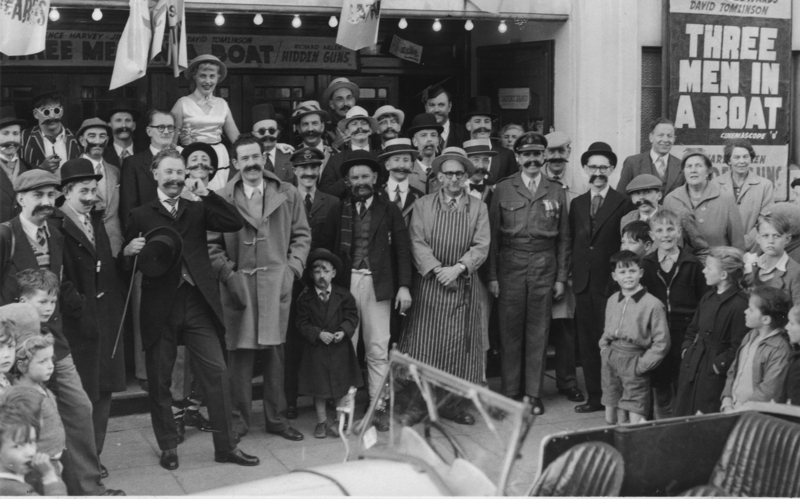 Toc H members and friends all sported handlebar moustaches,and there was a competition for the best one held, in the Empire Cinema on Church Street where the film was being shown, and it was judged by Frederick Garwood who’d recently set up shop in the town as a barber.One of the TocH members pictured in the first photograph is Eric Swannell (he’s the first on the left with the bowler hat, leaning on the car).Can you tell us who else is in the photo? If you were there, can you contribute your memories below ? My Father, Charles Meachem was a Member of Wolverton Toc H for several years, and myself and a friend rode our ponies at the head of one of the parades, we were led by “Boxer” Adams. We also toured Stony Stratford with “Billy Plonks Circus” dressed as Liberty horses. Such Fun. I know Dad went to the Royal Albert Hall one year with Toc H and did a turn there. Chap on the Penny Farthing is Boxer Adams of Cambridge Street Wolverton, a close family friend and neighbour. I think the little truck he is leaning on would be one of the many they had in Works to transport materials around the Works and they also delivered the cash boxes on pay days to the various works shops.